← How do you feel about formulas in publishing? Over the past couple of months I have been enduring something of a family crisis. One of the minor side effects of it all is that I’ve barely blogged. Even when I could find the time or inclination it would have been difficult to find something to discuss as I’ve barely read a book – or thought sensibly about one – for weeks. But tonight as I opened my mail I was excited by a bookish thing for the first time in ages. 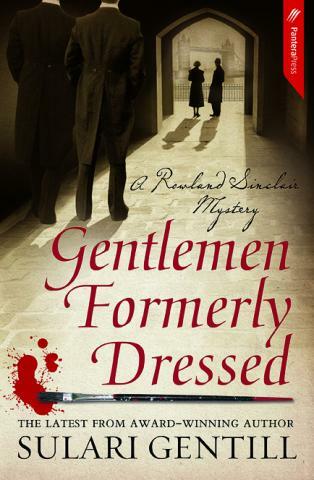 I was lucky enough to receive an early copy of the fifth book in Sulari Gentill’s crime series set in the 1930’s. I have adored all the previous books in the series for their humour, Australian sensibility, historical details and gentle undercurrent of social commentary. And just because reading them makes me happy. I quite literally couldn’t wait to dive in to this latest installment and have already perused the first chapter. Though to do the book…and myself…justice I shall plan a time when I can savour reading the rest of it. As it happens there’s a good chance the worst of this particular family crisis might be resolved on Friday and we’ve a long weekend here this weekend. Serendipity? A bizarre murder plunges the hapless Australians into a queer world of British aristocracy, international politics, scandal, spies and Fascist Blackshirts. A world where gentlemen are not always what they are dressed up to be. I’m looking forward to losing myself in this intriguing tale and wish you all some bookish joy of your own. This entry was posted in random thoughts, Sulari Gentill (Aus). Bookmark the permalink. Bernadette – I am so sorry to hear that you’ve been having family issues. Not only are they awfully hard to cope with but they’re enervating. I hope this one is resolved soon, and I’ll be looking forward to your reviews/rants/other posts again. Glad to hear that the Gentill has arrived for you. Bernadette, chin-up hope things resolve themselves soon and satisfactorily. On the down-side I don’t think this book is my cup of tea – so I’ll pass, hope it works for you though! Sorry to hear that Bernadette. Hope everything is resolved satisfactorily. I hope things will smooth out in the near future, and that you enjoy your new book. I haven’t come across this author, but will go and look him up. Sending good thoughts your way, Bernadette, and I hope things improve to the point where you can enjoy reading about someone else’s problems/life for awhile. Bernadette, I do hope the family crisis resolves itself soon, and you can enjoy your Labour Day holiday. Very best wishes. Bernadette, sorry to hear about your troubles, but hopefully it’s near to resolution and things will get back to normal. I was actually planning a blog post begging you to start writing reviews again as I source so many good reads through you – I thought it was the judging gig that was limiting the reviews/posts. So enjoy Saluri’s book and I look forward to finding out how you found it. I figured that family crises were pulling you from the blog, and hope they are resolved, so you can return to reading and blogging. So great that just the right book for the moment arrived, and that you can dive into it. I’m reading the J.K. Rowling/Richard Galbraith book “Cuckoo’s Calling.” While it’s not for all mystery readers, as there’s not suspense, and it’s not a page turner, it’s been good for me for the last week or so. It’s long and detailed and many mystery readers would consider it slow and plodding, but sometimes this is the right type of book for a certain mood. And it’s been right for me. On to solving family matters and to good books! I’m pleased to hear GFD might bring you some distraction but so sorry to know that you are in need of it. I hope your crisis resolves as happily as possible. Bernadette: Family crises are wearing. Best wishes. I hope you are right that there will soon be a resolution. Excited about the new Gentill book! – I hope it proves a good distraction as you sort things out. Hope the family issue has resolved itself satisfactorily, Bernadette. Things like that can really take a bite out of a reading mood. And thanks for the heads up about Sulari Gentill’s crime series – I’m hoping my library carries it. I do know how you feel, Bernadette. I’ve been right there with you on the domestic hassles front. I’ve not only been reviewing less but also reading less too. However I am on holiday in Finland and have read 3 books in as many days. 2 were good, 1 indifferent. But it’s so nice to get my reading mojo back.